Do you feel that the work you produce is never good enough? Do you work endlessly on projects or run them right up to the deadline? Is it hard for you to even start on a project because you fear it won’t be good enough? Do you sit staring at your computer, unable to get going? Do you feel that your appearance, your home, or your children must be perfect or else you are a failure? Do you believe that making a mistake is the worst thing you can do? If you answered yes to some of these questions, you may be one of the many people suffering from Perfectionism. If so, you have a need to be perfect that goes far beyond what is actually required for excellence. This overblown demand on yourself can get in the way of your getting jobs done on time because you spend far too much time on them. Alternatively, it can lead you to procrastinate and avoid working on projects. Perfectionism can cause you to be uptight and worried much of the time. It can keep you from being relaxed and having fun and joy in life. It can unbalance your life because you spend far too much time on work or other attempts to be perfect, leaving little time for family, friends, love, and creativity. Your need for perfection is probably based on fears that are unconscious and come from unresolved childhood pain. Our Transforming Perfectionism Course will help you to understand and work through these fears using Internal Family Systems Therapy, a powerful, cutting-edge, user-friendly method that is revolutionizing the practice of psychotherapy. 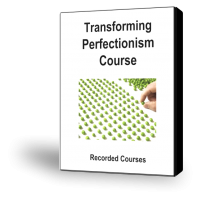 You will be able to transform your Perfectionism into a resource rather than a problem The course is unique in including both deep internal work and practical strategies and exercises for overcoming perfectionism in your life. As a result, you will be more present in each moment and less anxious about the outcome of your work. You’ll be able to discriminate when your work feels “good enough” and allow it to come to a natural completion without forcing it to be perfect. The book will help you do your work in a way that flows, so you can feel more pleasure and lightness. You’ll go through your life in a more relaxed way, without pushing, yet still make progress with your work. By letting go of the struggle to be perfect, you will find time for your other needs, such as socializing, relaxation, fun, and personal health. In the end, you will be much more at ease as you produce excellent work, while having a balanced, relaxed, and happy life. 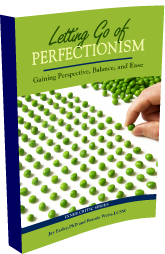 Read or skim Chapters 1-4 from our ebook Letting Go of Perfectionism. This will help you understand Perfectionism, how it operates in your life, the underlying motivation behind this pattern, and its origins in your childhood. 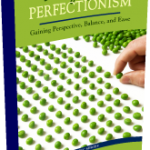 For additional learning about Perfectionism, listen to a recording of our Perfectionism Teleseminar, which includes lectures and discussion, two different exercises for working with perfectionism and activating a healthy alternative. Now you are ready to learn how to transform your Perfectionist Part using Internal Family System Therapy (IFS), a powerful, user-friendly therapy approach that you can use on your own or with a friend. Listen to Transforming Perfectionism Using IFS – Lecture. This introduces IFS and explains how to use it to work with Perfectionism. Read Transforming Perfectionism Using IFS – Manual. This explains in detail how to use IFS to work with and transform your Perfectionist Part. We are excited about the online personal growth community we have created. One of the sub-groups within this community is for people who are working through Perfectionism. There you can find a partner who is also taking this course to work with doing peer IFS counseling. You can post to the Sharing Discussion within the Perfectionism Group. Use this for anything you would like to share about your process with other people who are taking the course or reading Letting Go of Perfectionism. You can also ask questions to get help with your process. Any questions you ask will be answered not only by other participants but also by Jay Earley or Bonnie Weiss. Perfectionist A – Getting to Know and Unburdening a Critic. In this IFS session, the client identifies the Perfectionist Critic, separates from parts that have attitudes or feelings toward it, and places the child who is being hurt by the Critic in a safe place in order to get into Self. Then she gets to know the Critic, understands its motivations, updates it, brings it into the present, and unburdens it. Perfectionist B – Unblending from the Criticized Child and Transforming the Critic. This session is a good example of a client’s difficulty in articulating the Critic because she is blended with the child part who is being criticized. Bonnie helps her to differentiate what is going on in her system and separate the voices. She then can get a clear picture of the Critic, unearth the childhood memories of its origin, retrieve and unburden the exile, and transform the Critic. To help you further with this process, you can work on yourself using our guided meditation Working with Your Perfectionist Part Using IFS. This takes you through the process of accessing your Perfectionist Part, getting to know it, and developing a trusting relationship with it. As part of the course, you get a 50% off voucher for one IFS session with Jay Earley, Bonnie Weiss, Everett Considine, or another top-notch IFS therapist. You can use this to make significant headway on working with your Perfectionist Part. Now that you have made some strides toward working through the underlying psychological issues behind your Perfectionism, you can practice changing this behavior in your life. For a fuller understanding of Perfectionism and how it fits into the Pattern System, read the final chapters in Letting Go of Perfectionism. For additional help in changing your behavior, listen to our Ease Inner Champion Guided Meditation. This helps you to activate an Inner Champion that can be an ideal support when a Perfectionist Inner Critic is causing pressure, anxiety and feelings of self-doubt. It will support you in replacing Perfectionism with Ease.